Diet and pHAcid/Alkaline Imbalance: Over-acidity, which can become a dangerous condition that weakens all body systems, is very common today. It gives rise to an internal environment conducive to disease, as opposed to a pH balanced environment which allows normal body function necessary for the body to resist disease. A healthy body maintains balanced pH levels and reserves to meet emergency demands. When excess acids must be neutralized our alkaline reserves are depleted leaving the body in a weakened condition. A pH balanced diet, according to many experts, is a vital key to health maintenance. First and foremost, learn about pH balance in the body. You'll hear this over and over when you go site-hopping. Eating a healthy diet and staying alkaline has been known to reduce the itching sensations caused by Morgellons. A healthy body is one in which the pH is 7.35-7.5. This is an alkaline state. 7 is considered neutral and anything under 7 is considered an acid environment. If you had a swimming pool, you'd want to raise the pH above 7, otherwise bacteria would thrive in it. The body follows the same principal. Disease supposedly cannot survive in an alkaline state. We achieve this state of balanced alkalinity through diet. Every decision you make about what to put in your mouth will affect your acid/alkaline ratio, so being conscious about your food choices will determine if you will slow the disease down or give it fuel to continue to rampage your body. 'Homeworld' who has contributed extensively to this site with his photo documentation and scientific observations, took it upon himself to test his urine in both the acid and alkaline state. When the pH was 5.3 he sat and watched as the urine 'assembled' fibers. After one hour sediment was apparent in the bottom of the test tube. When the same test was repeated with alkaline urine he saw micro fibers in it, the difference being was that these micro fibers did not grow any further. Having run these tests numerous times and achieving the same results we can deduce that maintaining an alkaline state will slow fiber growth way down. Also, many have shared that when they cleaned up their diets, the symptoms of itching, biting, stinging and crawling were greatly reduced if not totally eliminated. See the bottom of Fibers in Urine link for Homeworld's observations about pH and fiber growth. A wonderful and easy-to-read book that goes into great detail about pH is, The Vitamin D Cure by James Dowd. He gets into all the specifics needed to understanding pH balance such as the proper proportions of foods to prepare and what happens to a body when it is acidic, as well as how much protein your body needs based on your weight. He includes sample menus to get you started. You might be pleased to find out that getting proper Vitamin D and balancing your pH will impact your health in ways you never imagined such as minimizing arthritis, decreasing the risk of diabetes, heart disease and cancer. So what are the practical aspects of dealing with your pH on a daily basis? You will need pH test strips for your urine or saliva. These can be bought at better pharmacies (Duane Reade and CVS do not carry them). Whole Foods carries one in roll form made by Enzymedica—or see the many brands online. There is even a device called a pH meter that one can use with urine.Each kit has its own color chart. Dipping the strip into your urine will cause it to change color. By comparing your sample to the color chart, you will be able to determine easily your current state of pH balance. At first, you'll want to do this 4-5 times a day (I try to test with each bathroom run) to get a sense of how fast the body is affected after eating and to correct any shifts so you stay as evenly as possible in an alkaline zone. Although we are aiming for an alkaline body, that does not mean that you should eat only alkaline foods. You need both acid and alkaline foods to survive. Too much alkalinity is just as bad for your health as too acid. It's all about finding a balance between the two.Some people have difficulties maintaining proper pH just using diet. One quick way to shift the alkalinity is with juicing. Include high alkaline foods like lemon, apple, kale, watermelon along with other alkaline fruit and veggies. Another way to attain alkalinity is with the 'biofilm buster'. –1 level teaspoon of aluminum-free baking soda (Bob's Red-Mill Baking Soda available at most health food stores)In a cup, add the vinegar, then baking soda. It will begin fizzing and rising—do not stir, otherwise it will react like warm champagne in a shaken bottle, foaming out of the cup! When the mixture settles down add water to fill. If additional support is needed one can use pH buffers. Look for products like Calm Magnesium and Vaxa to name but two. Update: I no longer use the biofilm buster. Instead I ingest smaller amounts of baking soda throughout the day as needed. You can see my live blood microscopy page for some of Rick Panson's (health coach and microbiologist) recommendations as well. Keep it simple. Eating food in a natural unprocessed state is the most healthful way to go. Many processed foods contain genetically modified (GMO) ingredients and they are not labeled, so you can't know if you're ingesting them. 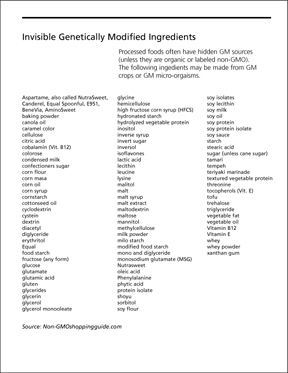 You'll want to eliminate your exposure to these GMOs as there is enough evidence to show they are bad for one's health. Read Jeffrey Smith's "Seeds of Deception" or watch his documentary "Genetic Roulette – The movie." He is pretty much the go to source for current info on genetic modification which little as it's been tested, is being linked to all kinds of health issues. More on GMOs below. If you have Candida or a fungus problem, you might want to monitor how much, if any, fruit you consume. Foods such as white flour, white sugar, ice cream and beer are highly acidic. Look for other satisfying alternatives. To recover from an illness it is recommended that 80% of your diet be vegetables/fruit and 20% be protein. This will roughly translate into 3-4 times the amount of vegetables to protein. In a healthy state you can shift the balance to 70% fruit and vegetables to 30% protein. Eat organic if you can. Many Morgellons sufferers are dealing with oxidative stress and trapped toxins in the body that they can't get rid of. 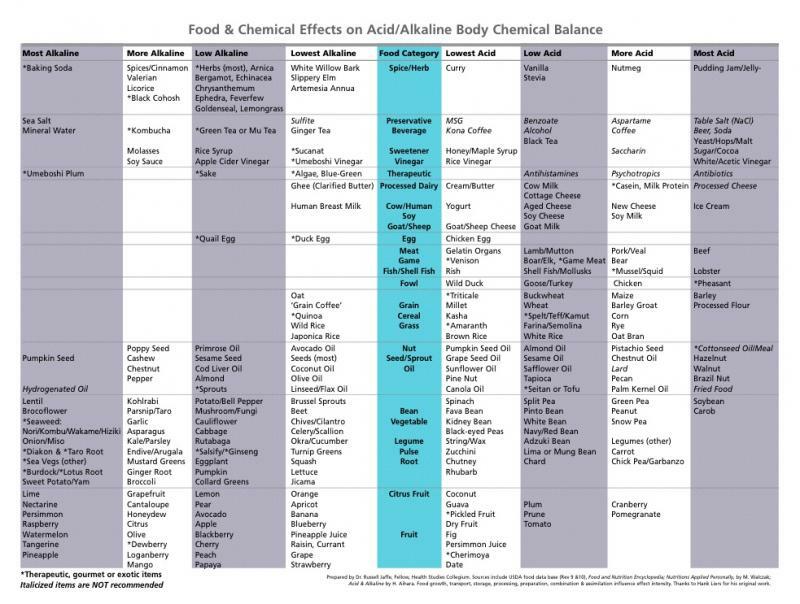 No need to pump any more pesticides into yourself.Attached below is a handy at-a-glance pH chart for Acid/Alkaline reference. This should give you a good start in understanding the acid/alkaline properties of food. Many of us have a hard time controlling ourselves around nuts (see me waving here). While they are good for you if you are not allergic, too much will bring your body into acidity. Try eating only 10 nuts at a time and see what that does to your pH. Also certain nuts such as peanuts are high in mold a definite no-no for Morgellons sufferers as we are known to have yeast, fungus, and mold issues. Meat If you are eating animal protein, organic, antibiotic/hormone-free, grass fed, grass finished beef is the way to go. Make sure if you are buying pre-packaged organic beef that the label includes grass finished, since the animal may have been grass fed, but fattened before going to market with GMO corn. This fact is conveniently left off the label. The best way to buy meat would be in the local farmer's markets where there are usually those farmers that have organic beef. Super Foods Super Foods are nutrient-dense and can help assist in alkalizing the body.Coconut Oil: Rich in fiber, vitamins and minerals it is one of the healthiest foods on the planet. Additionally, it is anti-viral, anti-fungal, anti-bacterial and anti-parasitic, touching on all things Morgellons sufferers are dealing with. Unlike other oils it tolerates higher heat without causing oxidation and free radicals (which are cancer causing). An added benefit is that coconut oil is converted to energy immediately and is not stored as fat like other oils. This means it won't end up sitting on your hips as extra weight. Coconut oil has no cholesterol and is a great source of medium chain fatty acids which helps lower the risk of atherosclerosis and heart disease and one study found it to help with dementia. To learn more about this wonderful oil go the the Coconut Research Center. There are two kinds of coconut oil, unrefined which has the natural coconut flavor and refined which has had the flavor removed. Spirulina: This blue-green algae is loaded with supportive nutrition in the form of vitamins and minerals including Vitamin E, B-complex, copper, calcium, magnesium and iron and is a great source of protein. It is also a rich in the antioxidant beta-carotene and the essential fatty acid gamma linolenic acid (GLA) that is found mostly in plant-based oils. Omega-6 fatty acids play a crucial role in brain function as well as normal growth and development. It is high in Chlorophyll which is believed to soothe inflammation and normalize digestion of amino acids.It comes in two forms, powdered and pills. Bulk, powdered is the most economical way to go. Seaweed and KelpKelp is a good source of protein along with potassium, iron, B6 and dietary fiber. It has trace minerals and iodine which helps in proper functioning of the thyroid. Seaweed absorbs waste from the body fluids, binds with poison, and carries it out. It also pulls heavy metals from the body. Recently Dr. Mercola pointed out that kelp, like fish, might be carrying heavy metals—a point I hadn't thought of. It's best if you can find a product that has been tested for heavy metals. (With the radioactive waste being pumped into our oceans [Fukushima] we might have to reconsider ingesting this vital substance. I would check labels to make sure the source is NOT Japan). Start introducing kelp slowly as it can cause one to feel ill as it detoxifies. Goji Berries Goji berries have long been utilized as a "longevity fruit." It has powerful antioxidants that fight damaging free radicals. Used to increase stamina and strength, it is also a blood cleanser. It contains 18 amino acids, 8 essential amino acids, essential fatty acids, and is high in vitamin C and beta-carotene. Gut Health﻿ From Dr. Mercola's site: http://articles.mercola.com/sites/articles/archive/2012/12/15/caroline-barringer-interview.aspx﻿"Cultured or fermented foods have a very long history in virtually all native diets, and have always been highly prized for their health benefits.The culturing process produces beneficial microbes that are extremely important for human health as they help balance your intestinal flora, thereby boosting overall immunity. Moreover, your gut literally serves as your second brain, and even produces more of the neurotransmitter serotonin—known to have a beneficial influence on your mood—than your brain does, so maintaining a healthy gut will benefit your mind as well as your body. Fermented foods are also some of the best chelators and detox agents available, meaning they can help rid your body of a wide variety of toxins, including heavy metals. This is part of what makes Dr. McBride's GAPS Nutritional Protocol so effective. It effectively restores your own detoxification system, and the fermented/cultured foods are instrumental in this self-healing process. And you don't need to consume large amounts either. Caroline recommends eating about a quarter to half a cup (2 to 4 oz) of fermented vegetables or other cultured food, such as raw yoghurt, with one to three meals per day. Bear in mind that since cultured foods are very efficient detoxifiers, you may experience detox symptoms, or a "healing crisis," if you introduce too many at once. Caroline recommends beginning with very small servings and working your way up to the quarter- to half cup serving size. This way your intestinal microbiota has the chance to adjust. "If they introduce too much, too fast, they will experience some die-off symptoms that can be uncomfortable and confusing. This is where we lose people. The innate intelligence of their bodies tells them to eat more cultured foods because they're in such a state of dysbiosis. So, they go to town and eat a whole jar of veggies. Then they go into a healing crisis and they are afraid to try cultured foods again,"
Caroline warns."... Start slow, and that way you won't have a headache or you won't have that outbreak... you will start to see yourself eliminating more naturally, and the proper stool will form, the shape will change, and it will be all be beneficial to you. Let your innate intelligence guide you, and if you see something or feel something that's not so right, don't dismiss the cultured foods and say, "Oh, that was bad for me, it caused a reaction." That's not what your body's telling you. Your body's telling you, "Slow down. "It is incredibly easy to cultivate fermented vegetables at home. A quick visit to YouTube will show you how to effectively do it. For those that have limited budgets and can't afford high-end probiotics, this is a great way to get beneficial bacteria into your system. If using a metal screwtop on the jar, make sure that the liquid covering the vegetables stays 1 inch below the lid, otherwise it might corrode the lid. Remember, fermenting vegetables give off a gas that needs to escape, so lightly screw on the top which will allow trapped gas to leave. Please note, Dr. Mercola suggests opening a probiotic pill into the mixture or using juiced celery instead of salt to ferment. There are so many different ways to make cultured vegetables, so play around. If you notice anything unusual like mold forming on your batch, throw it out, wash well and sterilize your container before attempting again. http://www.wildfermentation.com/wild-fermentation"
Genetically Modified Foods The American Academy of Environmental Medicine reports that "Several animal studies indicate serious health risks associated with GM food," including, infertility, immune problems, accelerated aging, faulty insulin regulation, and changes in major organs and the gastrointestinal system, many physicians advise ALL patients to choose healthier non-GMO foods." For a handy reference guide visit Non-GMOshoppingguide.com 95% of the corn and 75% of the soybeans grown in the U.S. have been genetically modified. A note about Vitamin C: Most Vitamin C sold is made from corn yet it is never listed on the label. There is one from Ecological Formulas﻿—look for the one made from Tapioca. In this TedTalk, Dr. Wahl who was crippled and in a wheelchair from Multiple Sclerosis shares what she learned about diet and how she was able to reverse and heal her illness. It's amazing to watch the transformation. If she could accomplish such a spectacular feat as this, what might this diet do for the Morgellons sufferer? nvic.org National Vaccine Information Center. I love this organization and recommend to join their group if you are on facebook as they are always posting current information that will come into your feed. gotmercury.org Eating seafood high in mercury is hazardous to your health, especially for women and children. The "Got Mercury?" calculator helps you make healthier seafood choices. Just enter your weight, the seafood type, the amount of seafood you will eat during a week, and click the calculator button. These calculations are based on EPA and FDA data. bodyecology.com learn how to make yogurt and about coconut water and its benefits.